Friday night Patty and Katie and I carved pumpkins at my house. The pumpkins are as follows left to right... Patty's Katie's and mine. Mine is based off how I felt all day Friday having a migraine and crying and being in pain. 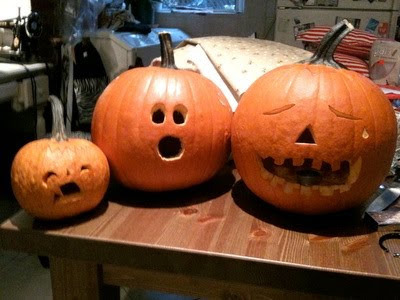 Awww... it's a cry baby jack-o-lantern... cept sadder. They're all good!